Dating to fill a void is never going to result in finding the right person. You need to remember you are always in control of the situation, and you are fine just as you are. In the quest to find true love, think of dating as a fact-finding mission, discovering who this person is sitting across the table from you. It has nothing to do with what they think of you, and it has everything to do with what you think of them. Learn more about how to find true love in We: A Manifesto for Women Everywhere. Dating is the process of looking for someone who is worthy and able to fill an incredibly important and intimate role. It’s an information-gathering process that takes time. Do first interviews and then second, third, fourth, and fifth—as many as you think you need. Use it to find out who the person is and whether he might be able to meet your requirements. Treat dates as opportunities to research whether you want what’s on offer. Don’t try to close that anxious gap between liking someone and not knowing whether it’s going to work by pushing things along too fast. From now on, you’re the chooser, not the chosen. If you find yourself focusing on what your date is thinking about you and whether or not he likes you, hit the pause button, because you’re abandoning yourself. What others think of you is their business. What matters is what you think of you—and in this instance, of them. Don’t miss these 5 dating tips that everyone should know and make sure you assess your online dating choices. Actress Gillian Anderson and journalist Jennifer Nadel, friends for more than a decade, have created the road map they wish they’d had for how to live a meaningful life. 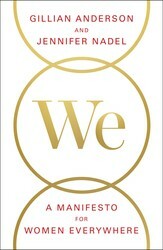 WE: A Manifesto for Women Everywhere is an uplifting, inspirational, and intensely practical manual for change, providing nine universal principles that offer a path for dealing with life's inevitable emotional and spiritual challenges. WE is a rallying cry for women to join together and create lasting change in our own lives, our communities, and across the world. Gillian Anderson is an award-winning film, television, and theater actor and producer, writer, and activist. She currently lives in London with her daughter and two sons. Jennifer Nadel is an award-winning broadcast journalist, qualified attorney, writer, and activist. American-born, she lives in London with her three sons.